The North Davis Riparian Greenbelt project will "green" a storm water channel in north Davis by replacing weeds with drought-tolerant native plants, establishing trees to shade the channel, and creating educational areas to learn about native plants and sustainable landscape management. Funding for this project is provided by the Strategic Growth Council's Urban Greening Program, funded by the voters of California via Proposition 84. Project objectives and partners are at this link. To stay informed about this project, enter your email below so we can keep in touch. If you would like to volunteer, see our events listings for opportunities along the channel and other local natural areas, or consider joining the "Friends of the North Davis Ditch." More information about the Friends group is available at this link. Thursday, January 5: Yolo County RCD staff will be spot-spraying weeds as weather permits. Wednesday, January 11: Putah Creek Council & Yolo County RCD staff will be removing drip irrigation systems in Sections 3 & 4, house side and adding grass seed in bare spots on the channel. The specifics of the project were determined based on community input, City maintenance needs, and habitat value. Click here to view comments on the plans, and click here to visit frequently asked questions about the project. Channel planting began Fall 2013. Phase 1 activities are now maintenance, weeding, and monitoring plant success. The first community meeting was held August 19, 2013. Final plans are available on this page. Due to budget restraints, some elements had to be cut from the final installations (such as benches). 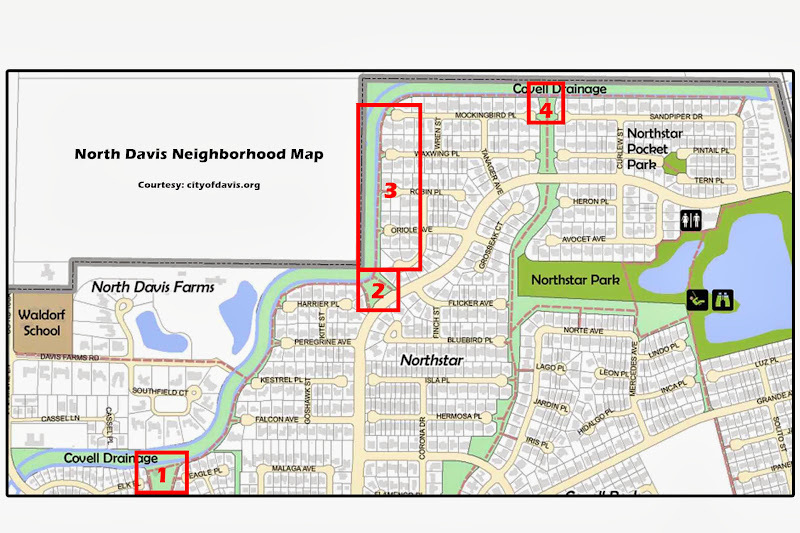 If you are interested in donating a memorial bench in the North Davis Greenbelt, please contact the City of Davis Parks and Community Service Department at (530) 757-5626. PDFs of the Interpretive Panels, landscape guides, and links to additional resources are available at this page.